The 74th Year of his Age. in the 88th year of her age. 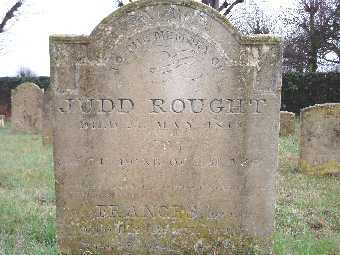 The Rought name is found with several spellings even for the same person, e.g. Roult, Rowlt, Rolt and others. The following table is in sections by generation. The chart is read from left to right with the earliest generation at the left and the youngest children at the top. Numbered links to the next section are shown to the right if there are more descendants. The numbers themselves have no significance, other than their position in the entire Stone family tree. At the top of each section to the left is a numbered link to the earlier generations, where applicable. | | b c1825 Stafford, Staffordshire. | | | m 12 Aug 1839 Brosely, Salop. | | | b c1819 Broseley, Shropshire. | | | m 16 Oct 1834 Manchester, Warks. | | Wesleyan, Sheerness, Kent. | d 6 Sep 1823 Brandon, Suffolk | bap 29 Apr 1787 | b c1813 Birmingham, Warks. | | b Abt. 28 Aug 1808 Brandon, Suffolk | c51 Susan Roughs, 16 unmarr., no occ. | | c51 Bury Road, Brandon Thetford Nk | m 23 Jun 1857 St Peter's, Brandon, Sk. | | c81 Bury Road, Brandon, Norfolk | bap 27 Jul 1834 Brandon or Norwich? | | Widow, (Chamberlain), Retired furrier | c51 White Lion St. Brandon, Thetford, Nfk. | | d 18 May 1923 Kings Lynn, Norfolk. | | b c1806 Little Paston, Bucks. | | bap 20 Feb 1785 Brandon, Suffolk | d 27 Oct 1822. | | d 20 Jul 1821.